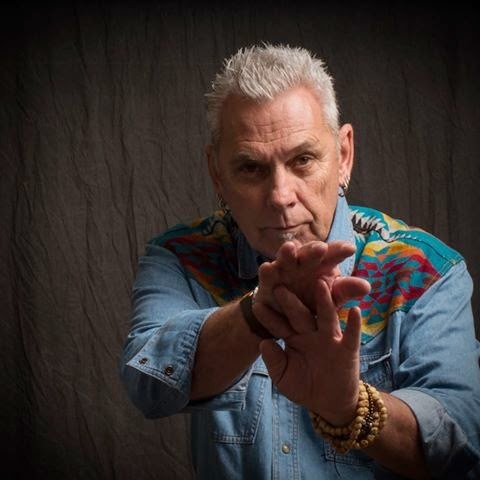 This month's installment of the Monday at Mahall's Poetry and Prose Series is a triple knock out featuring poets Jack McGuane, Ēva Xanthópoulos and Chuck Joy - plus, for any who dare, brews, bowling and a bowl-you-over open mic. Our guest host for the event will be Terry Provost! You won't want to miss this! July 7th at Mahall's in Lakewood. Jack's and Eva's photos lifted from their Facebook pages. Chuck's photo by Chandra Alderman. Jack McGuane age 86, has been a resident of Lakewood, Ohio, since 1974, when he moved there from New York’s Long Island. Jack has been married to Kathleen (Moriarty) for fifty-seven years and is the father of five, grandfather of six. He retired in 1997 from his position as Regional Manager for Fireye, Inc., and has been a poet ever since. He served for three years as poetry editor of Whiskey Island Magazine, won the Haiku Death Match (sponsored by Heights Arts), and was named Poet Laureate of Lakewood 2006-2007 by a board of judges and by proclamation of the Mayor. 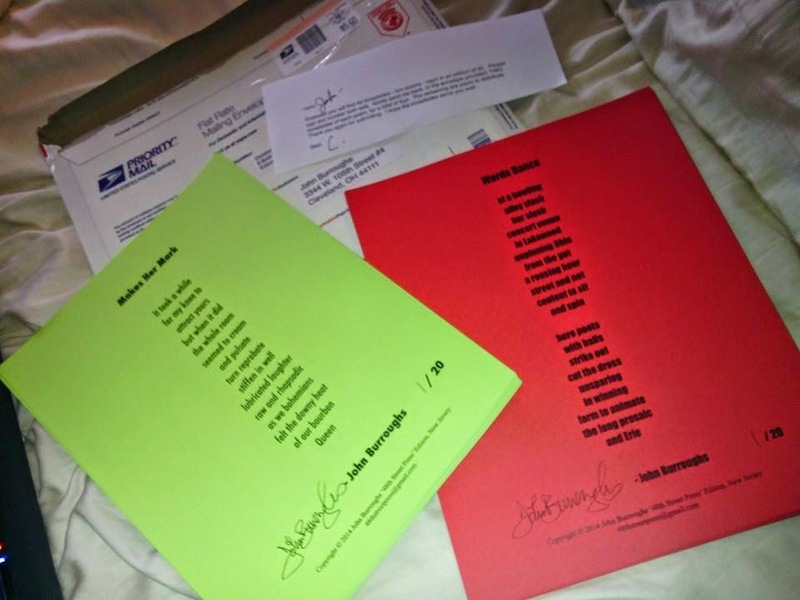 His poems have been published in the anthologies Family Matters (Bottom Dog Press), Come Together, Imagine Peace (BDP), and Lipsmack! A Sampler Platter Year One 2012 (NightBallet Press), and in Whiskey Island Magazine, Moonlit Magazine, ArtCrimes, the November 3rd Club, The City Poetry, and other print and online journals. His chapbook Sleeping With My Socks was published in 2008 by Deep Cleveland Press, and his collections Chickenhawk (2011) and Unfinished (2013) were published by NightBallet Press. Chuck Joy is from Erie, PA. His poems have appeared in Great Lakes Review, Ampersand Review, intentionalwalkreview.com, Medicinal Purposes, Lilliput Review, and Bogg, as well as anthologies edited by Sean Thomas Daugherty, Berwyn Moore, and Jack Coulehan. His publications include All Smooth (Destitute Press) and Every Tiger Wants To Sing (Poets' Hall Press). 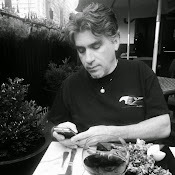 A poet impressed with the music and drama of lines, Chuck has brought poetry to the stage at The Orange Bear, Blue Planet Cafe, Confluence, every Snoetry, the Erie Book Store, Authors Books, Woodlawn Diner, and Mac's Backs. Chuck is excited to return to Mahall's! From 6 to 7:30 p.m. this Saturday during the 2014 Community Festival in Columbus, Ohio, the Ohio Poetry Association will present performances by five dynamic poets from across the state -- Dianne Borsenik, Louise Robertson, Mark Sebastian Jordan, OPA president Mark Hersman and John Burroughs (me) -- joined by musician/singer David Kender. And we're just a small part of the weekend. If you're in the area, come check us out on the Peace Village stage. For more information about Columbus' annual ComFest, please visit http://www.comfest.com/. Before GoDaddy deletes my old blogs, I grabbed a few screen shots of their statistics. First here's a chart of the Crisis Chronicles cyber litmag's viewership since I started it in mid 2008. And then here is a listing of the fifty most viewed works in the history of the Crisis Chronicles cyber litmag at its old site. I've recently transferred the litmag's content to a new location. As a result, some formatting problems have crept in and I hope to have those fixed eventually. You can check it out, though, at http://cclitmag.wordpress.com. As you know, this is my new Tao of Jesus Crisis blog. The old one will be deleted by GoDaddy this week when they discontinue Quick Blogcast (hence my move). But before it disappears forever, I wanted to save some of my GoDaddy statistics for nostalgia's sake. For one thing, I find it interesting to see which blog entries have gotten the most views over the years. Though I began the old Tao blog in 2007, GoDaddy didn't begin their new statistics format until the summer of 2008. So these statistics don't include the complete history if the blog, but they come close. This morning I noticed a new "review" on the Amazon listing for my 2009 chapbook 6/9: Improvisations in Dependence. It's by someone using the identity "night ballet." I knew it couldn't be by my friend Dianne Borsenik, who runs NightBallet Press and published my 2012 book The Eater of The Absurd. So I wondered who it was. I clicked on night ballet and noticed that he or she had reviewed other books, back in 2006. Since NightBallet Press didn't exist in 2006, and anyway is not and would never be responsible for such a "review," I presumed that this Amazon reviewer recently changed his or her screen name to "night ballet." One of this person's older reviews was of a book called Licensed to Kill. If you take the text of that older review and plug it into a Google search, you'll see that the reviewer's name change apparently hasn't yet propagated to all systems. You'll see her real name, which she used to review under before adopting the "night ballet" charade. It's Charlotte Mann. Crisis Chronicles Press is thrilled to announce the imminent publication of the legendary D.R. Wagner's new book, The Night Market. I love everything we've ever published, but if anything can be called the jewel in the Crisis Chronicles crown, this book is it. Perfect bound, featuring around 100 pages of D.R. 's best poetry, as well as cover and interior art by ReBecca Gozion, in my opinion this is the book of the year. For a limited time you can pre-order D.R. 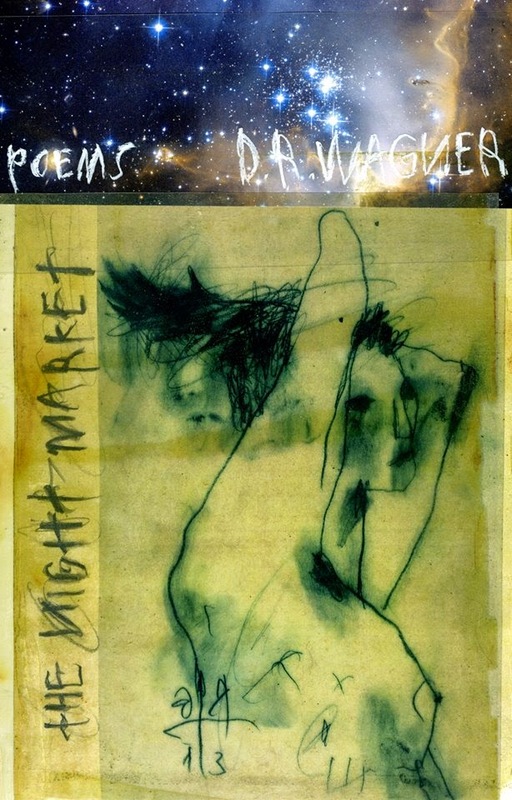 Wagner's The Night Market for $14.99 and get free shipping from Cleveland, Ohio. We are also making the first 26 copies of THE NIGHT MARKET available in a special lettered edition signed by D.R. Wagner and Rebecca Gozion. Order one of these (for $24.99) and Crisis Chronicles Press will throw in two additional titles: a surprise recent chapbook we're sure you'll love and a copy of our limited edition 2012 broadside of d.a.levy's The Wandering White. Details about the official release party for D.R. Wagner's The Night Market, in Locke, California, are forthcoming. 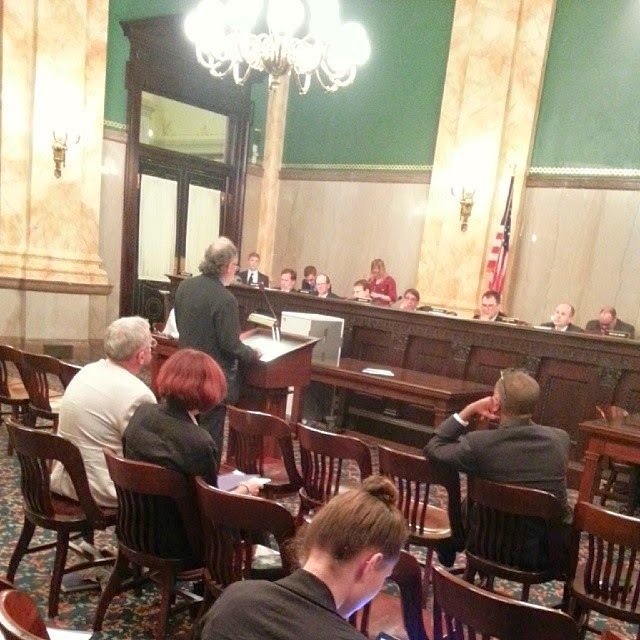 Ohio Senate Passes Bill Establishing Ohio Poet Laureate - House Next! Click here to read about it on the Ohio Senate's minority caucus blog. Many thanks to the senators, including many from our area and from both political parties, who have stepped up and supported Senate Bill 84. Letters from poets and other bill supporters from across the state, as well as great support from the Ohio Arts Council and Ohio Poetry Association have helped immensely. But our work's not done yet. Now Senate Bill 84 is moving on to the Ohio House for consideration and this is the perfect time for us to write to our state representatives and express our support for the establishment of a Poet Laureate position in Ohio. It doesn't seem right that Ohio, the home of so many fine poets statewide, is one of only five United States not to have such a position. So please write to your state representative and urge him or her to pass this bill. 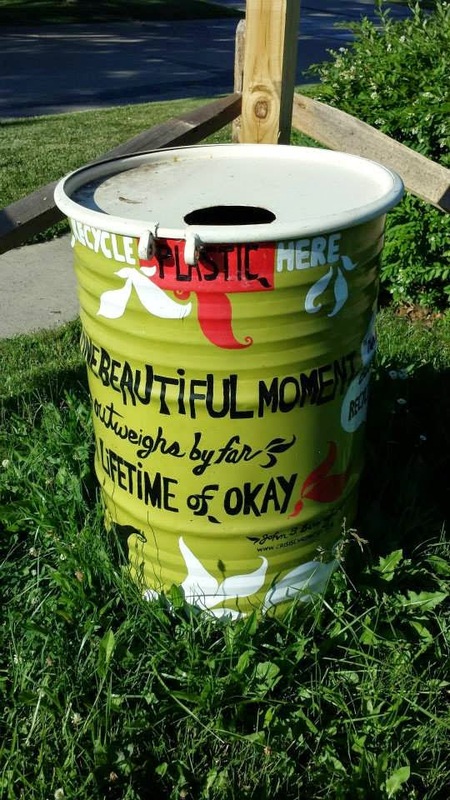 Click here to read Senate Bill 84, the Ohio Poet Laureate bill. Click here to read my testimony before the Senate in support of S.B. 84. 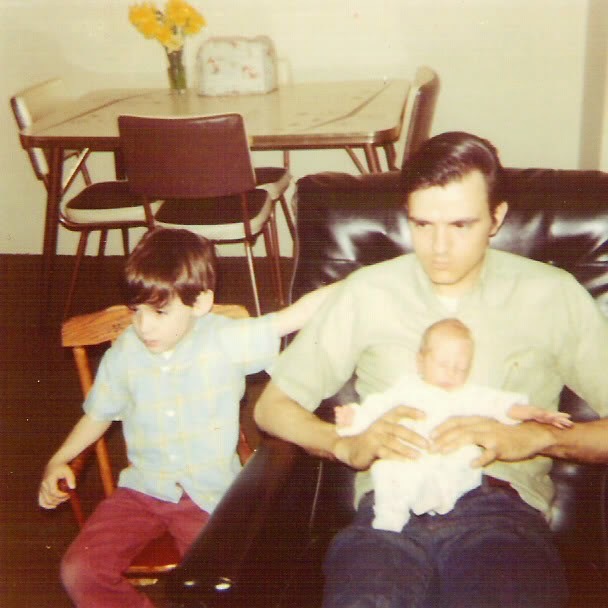 Click here to read Michael Salinger's testimony before the Senate in support of S.B. 84. Click here to read a statement by Steve Abbott on the O.P.A. blog in support of S.B. 84. Those Afghans should have been charged and tried years ago - or, if not, then released years ago. Third option: they should've been treated as Prisoners of War in accordance with the Geneva Convention (and released anyway as we end the war) - but the government wanted to have a "war" without declaring one. It's immoral (and unconstitutional?) to just keep a human being (no matter who) locked up indefinitely without due process because of what they might or might not do in the future. How can we expect other countries to embrace so-called American ideals when we don't? And we brought a captured American home, too. Six people who should not be locked up any longer were finally released. What's not to like? 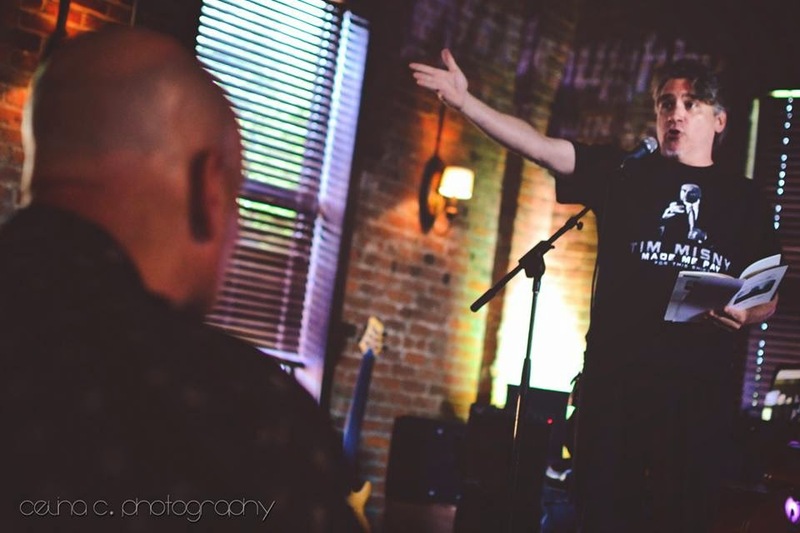 Here's me as the "sacrificial poet" at Sunday's 2nd annual Best Cleveland Poem Competition, sponsored by Tim Misny, hosted by Ray McNiece and won by Dianne Borsenik. Thanks to Celina C. Photography for the photo. Other finalists included Steven Smith, T.M. Göttl (second place), J.P. Armstrong, Dianne Borsenik, Jeffrey Bowen, Lee Chilcote, Renay Sanders, Michael Murray (third place), Geoffrey A. Landis, Danilee Eichhorn and alternates Anita Keys, Mary A. Turzillo, and Frances Lograsso. Great poems all around! I didn't expect to read because I didn't submit to the contest (mostly because Crisis Chronicles Press plans to publish an anthology of the finalists' poems), so when Ray asked me to serve as the judges' warm up I wasn't prepared with a suitable poem. But I did have a copy of my The Eater of the Absurd [2012, NightBallet Press]. The one real Cleveland poem in it - "Lit (Er, a Tour)" - was too long and and a bit depressing for the occasion, so I ended up performing "Roué Let" - which is not exactly a Cleveland poem, though it's about a casino and/or a fictional hook-up and there's no reason it couldn't have happened at our downtown Horseshoe, except that it didn't. One of the judges, a woman whose name I can't remember, gave me a 4.2 (out of 10), the lowest score anyone got that day. The other judges were more generous, with Tim Misny giving my not-really-about-Cleveland poem an 8.5, maybe because I wore his shirt. [Wink.] For comparison's sake, the contest winner, Dianne Borsenik, received all 10s from the judges. She earned it. You gotta be more than great to make Tim Misny pay. As for my own performance, I think it was good. But my poem did not exactly fit the theme (#ThisIsCLE), and I wasn't competing anyway. I had a lot of fun though. Click here to see more of Celina Colombo's photos from the event on Tim Misny's Facebook page. 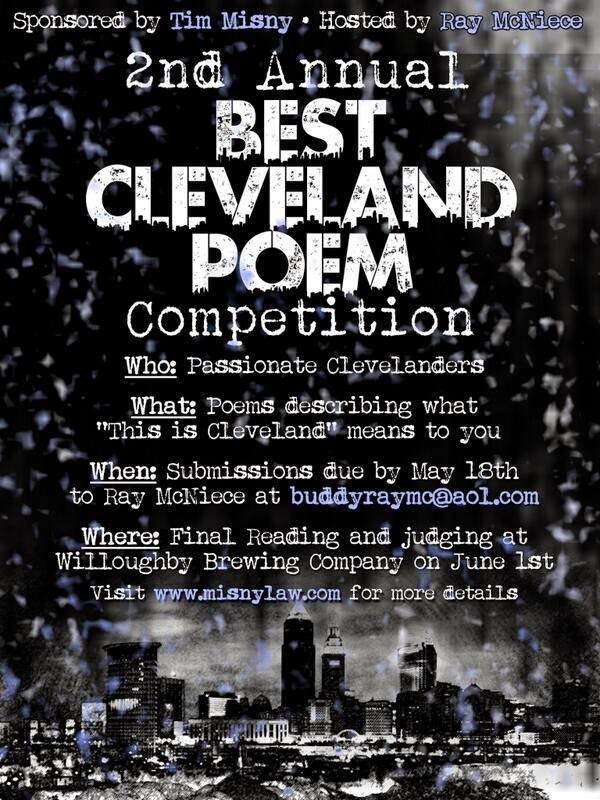 And click here to check out the book last year's Best Cleveland Poem Competition inspired. Some top poems from this year's competition will soon appear online at misnylaw.com. 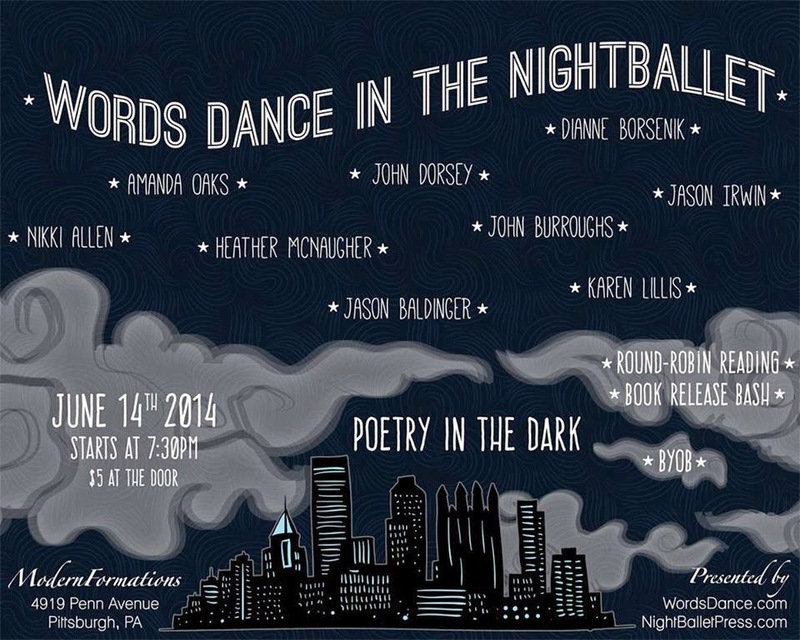 I'm super excited about reading with Dianne Borsenik, Amanda Oaks, John Dorsey, Nikki Allen, Heather McNaugher, Jason Irwin, Karen Lillis & Jason Baldinger this month at Modern Formations in Pittsburgh, hosted by Words Dance Publishing and NightBallet Press.